“Books and Beads” is back for National Poetry Month! Like the first installment of the series, this one is composed by Natalie Thielen Helper, Beadazzled sales associate and public relations manager. As always, anyone interested in contributing to this or other series should email Natalie a brief pitch at BeadazzledPR (at) gmail (dot) com. Although he lived and died hundreds of years ago and thousands of miles away, Rumi (ca. 1207-1273) is the best-selling poet in the United States. Born in Iran, he travelled all over the Middle East before dying at age 66 in Konya, Turkey. Over his lifetime he wrote thousands of lyrical poems, most of them about Allah, Muhammad, and his mentor Shams. It’s not hard to see why his work remains so popular today. His vivid imagery and surprising turns of phrase captivated me from the first time I ever read his work, several years ago. Rumi and his works are among the first things I think of when I read or hear about Persia and the Middle East; he provides a context rich in history, images, and beauty. So it’s no surprise I thought of Rumi when some beautiful ancient strands from the Middle East arrived at Beadazzled. A quarter century ago, Dupont Circle was already one of the liveliest neighborhoods in Washington. The 21st century and its rising real estate prices have taken their toll on local businesses. A 123-year-old ladies’ club recently got converted into apartments; the independent drug store is now a CVS; the eclectic gay community has moved east to Logan Circle. But one independent, community-oriented shop has remained. Now just across Connecticut Avenue from its original location, Beadazzled has been selling distinctive jewelry, international home accessories, and (of course) beads for 25 years. Since its founding in 1989 it has opened up another location in Falls Church, Virginia; and regularly sends buyers to select beads, textiles and other crafts from artisans all over the world. Its customer base includes collectors, decorators, long-time beaders as well as beginners, multi-media artists and makers, and the ever-present D.C. tourist crowd. How does a bead-based business thrive for 25 years in a highly competitive area? When I sat down to speak with the store’s founder, I realized that the answer lies with her. To learn Penny Diamanti’s bead business strategies, simply read on — and be sure to sign up for her “Bead Biz” classes at our Virginia store this May! Just call 703-848-2323 to register. 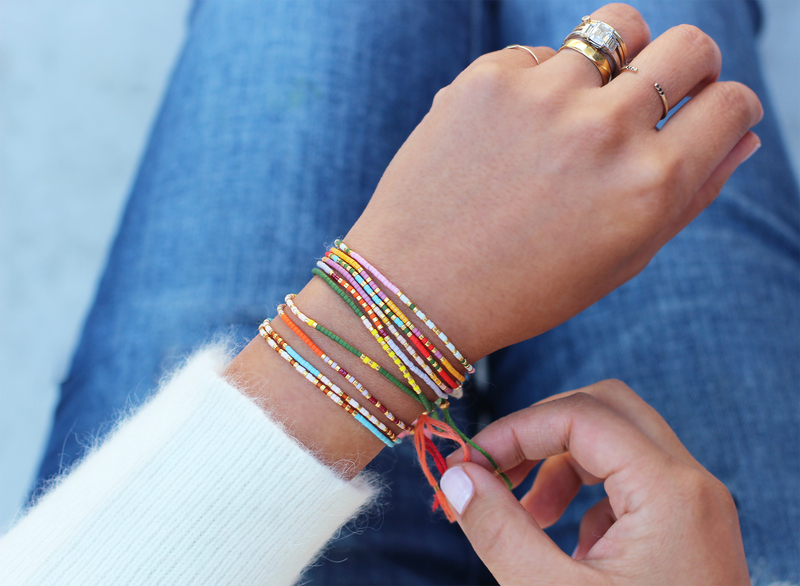 We all know that March is Women’s History Month — but it’s also officially “Seed Bead Month” at our Dupont Circle location! These two celebrations are more connected than you might think. Do you remember our “Guatemala Diaries” series? It chronicled our buyers’ adventures in that country as they selected beautiful hand-made crafts to bring back to you. The treasures they found included an abundance of intricate, breathtaking jewelry made from woven seed beads. These necklaces are all for sale on our website; simply click an image to view its listing. These incredible pieces were all made by women! We’ve just gotten some beautiful new (and limited edition) treasures in from all around the world. We have a sneak peek below, but you can check out more beautiful images on the Facebook pages for our Dupont Circle and Falls Church locations — or come by and see them in person! We had the honor of hosting some incredible Ubuhle Beautiful Beads artwork late last year. Thank you, Kristen, for writing this moving and informative post about these amazing artists! My 5-month study abroad in South Africa’s KwaZulu-Natal province awakened in me an undeniable connection to the African diaspora. It explains my instant and deep connection to the “Ubuhle Women: Beadwork and the Art of Independence” exhibit currently featured at the Anacostia Community Museum through January 4, 2015. This powerfully moving collection displays 31 works from a unique South African art form: a beaded tradition that has a sacred significance in the Xhosa and Zulu cultures. The exhibit not only evokes an emotional response, but it provokes thought as well. Each bead and the meticulous placement and stitching thereof create vivid imagery of stories, events, individuals, and locations that are specific to the artist, yet remain translatable to the general viewing audience. Beadazzled is pleased and proud to welcome Heather Widener, a Gemological Institute of America (GIA)-certified gemologist, to our Falls Church location this month! Heather will teach a “Gemstone 101” class on the 21st and 28th of February — call us at 703-848-2323 to register. 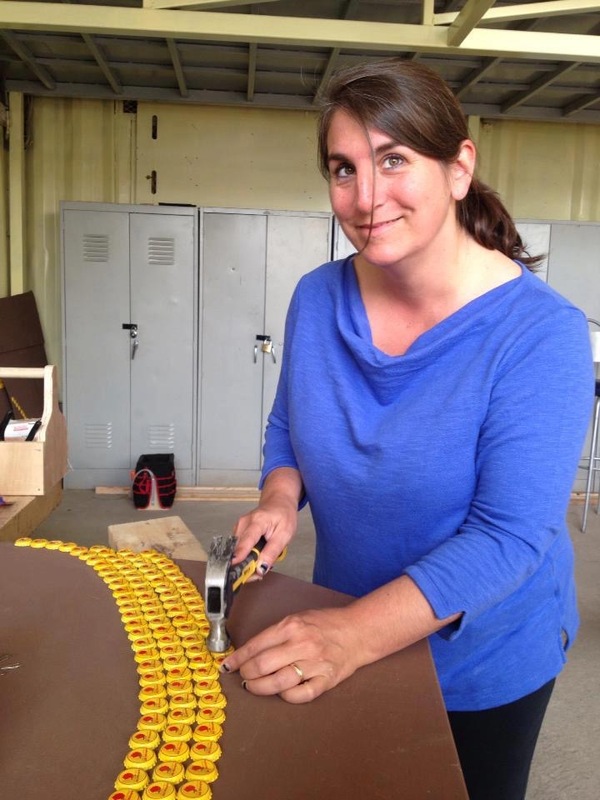 We sat down with Heather today to chat about her career, the intersections of science and art, how to tell real turquoise from fake, and more! Emma is back in Falls Church now, but she has one last gem show post for us. Read on to see and hear about an amazing glass bead artist at the show… an artist who just might be visiting soon! During this trip, we also went to several shows with glass artists all over the country. We met up with Cleo Buchanan, who you may recognize from our glass bead artist trunk show last August. Didn’t make it to the show? Well, don’t worry, we have another show planned for the spring! (Please note that the dates currently listed are subject to change.) You can keep up with all our latest news and events by joining our email list or by liking us on Facebook. Although she’s incredibly busy at the winter gem show, Emma has taken time out of her schedule to tell us a bit about the behind-the-scenes process of purchasing for Beadazzled! Read on to learn her strategy. When we attend large trade shows, the selection of beads and size of the shows can be massive. This week we’ve noticed a couple cool new trends in jewelry. Check out these new ideas for some inspiration! Just click each photo to see its source. Morse Code jewelry seems to be taking off lately — a quick Google search reveals a lot of cute inspiration! You can get a regular, even look to your Morse Code bracelets by using our Japanese delicas for the “dots” and Czech bugles for the “dashes.” Use chain, leather, knotted cord, or a “base color” bead for the spaces between letters and words. 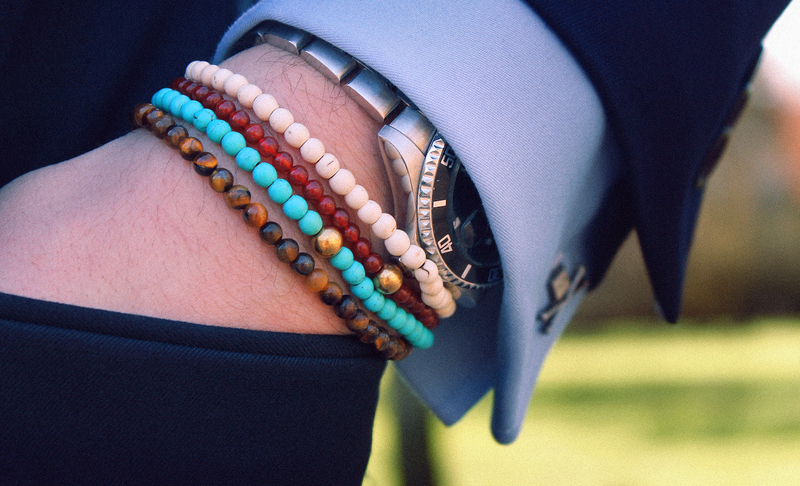 Bracelets for men are making a comeback. 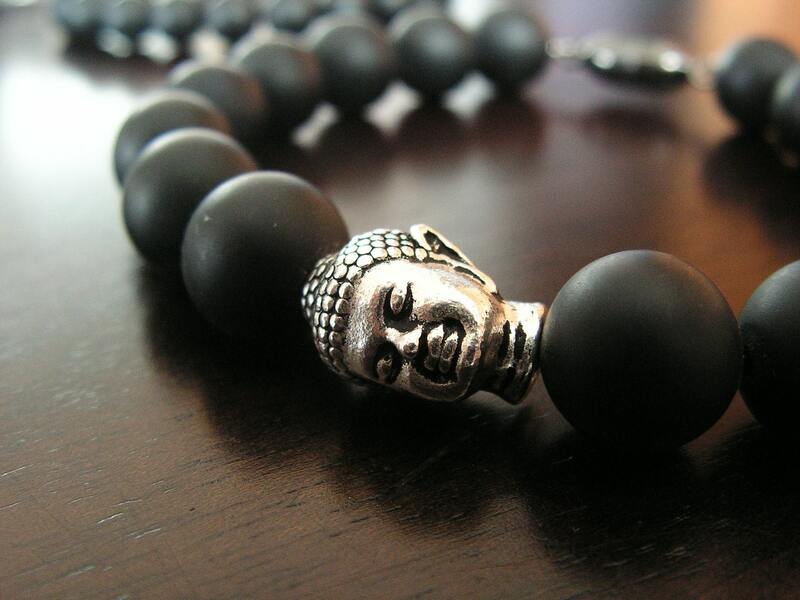 Favored materials include lava stone, neutral gems, and wood. For a bolder and more colorful look seen in the bottom picture, go for bright or shiny gemstones like turquoise, carnelian, and tiger eye. 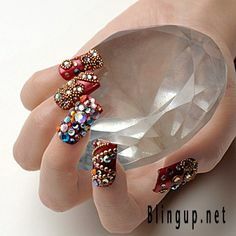 Beaded nail art is on the rise. Tiny beads, such as Size 11 Czech glass seed beads, seem more practical and popular. 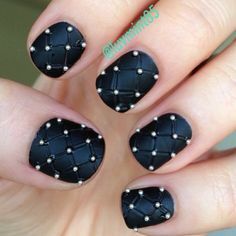 Beads are perfect for nail art because their holes hold glue well, making them stick for a longer time. But if you want to go big, don’t hold back! 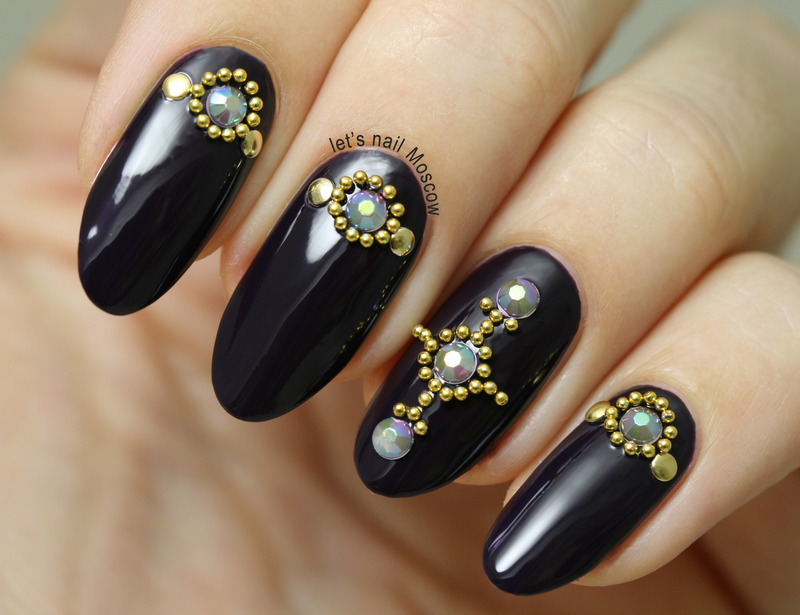 You can incorporate larger beads into your nail art for a bold, one-of-a-kind look. Just keep in mind that these dramatic styles are probably better for a special event than for a regular, everyday look. Comment with any new bead-related trends you’ve noticed! And as always, share the inspiration on our #BeadazzledCreations hashtag! Happy beading!